Thanks to John Campbell, Executive Director of AccelNow, we had the opportunity for a special tour last Thursday of both the existing Regional Center for Advanced Manufacturing in Kingsport and the new $2.5 million addition unveiled to the public the next day. It’s an amazing complex, operated by Northeast Tennessee Community College and supported by two local corporations – Eastman Chemical Company and Domtar – as well as the city and the Chamber. The new addition, dubbed the RCAM Academy, will support dual enrollment programs between high schools and the community college. We learned much of the programming in the original building is focused on apprenticeship training for Eastman, Domtar and local businesses. The new space, which was unveiled at an event on Friday (see this article), includes $1 million of equipment. Here’s a look at the new space. This is the entrance to the new building. 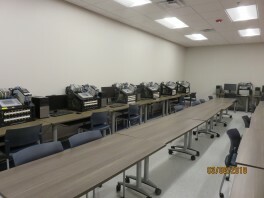 This is some of the equipment in the new space. Most entrepreneurial: Is it Gen Y or Baby Boomers?